The Society was formed on January 4th of 1931. It was an interesting time. Later that year, Arturo Toscanini presented the Bruckner Seventh Symphony with the New York Philharmonic, the first time the orchestra had presented the work in 45 years. That year also saw Frederick Stock conduct the Chicago Symphony in the Bruckner Ninth. The first honorary chairman was Harriet Bishop Lanier who used her influence to stage the New York premiere of Bruckner's F Minor Mass under the direction of Artur Bodanzky. The following year, the Society elected Martin G. Dumler of Cincinnati, Ohio to succeed Mrs. Lanier who had passed away. During his tenure, the Society initiated publication of the music journal, "Chord and Discord" which offered news and scholarly essays on the music of Bruckner and Gustav Mahler. The Society also commissioned the artist Julio Kilenyi (1885 - 1959) to produce both a Bruckner and Mahler medal of honor to be given to individuals who helped promote the music of these two composers. 9(see article on Martin Dumler below). 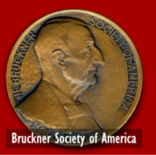 Recipients of the Bruckner Medal included Fritz Busch, Otto Klemperer, Serge Koussevitsky, Erich Leinsdorf, Eugene Ormandy, Frederick Stock, Arturo Toscanini, Bruno Walter, George Szell, William Steinberg, John Barbirolli and Paul Hindemith. Society member, Gabriel Engel wrote essays on the life and an analysis of the symphonies of Bruckner for publication by the Society. See The Life of Anton Bruckner . With Mr. Dumler's death in October of 1958, Robert G. Grey became president until 1962. 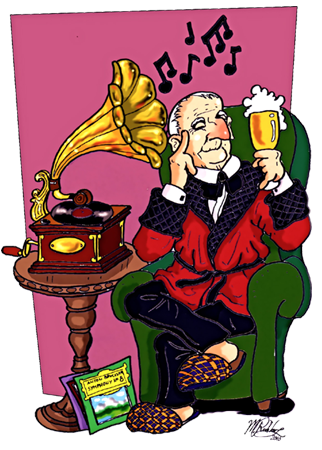 That year, Charles Eble (1915 - 2009), founder and owner of Eble Music in Iowa City took over as the President and Editor. Publications of "Chord and Discord" continued into the 1990's. With Mr. Eble's declining health, the Society became inactive. (see article on Charles Eble below). 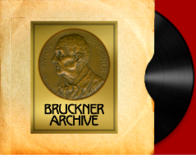 Unfortunately, none of the Bruckner Society's files prior to 1998 have been located, but correspondence pertaining to activities with the New York Philharmonic (1946-1965) can be viewed here. In 2009, after reading about the death of Charles Eble, John Berky, Editor of abruckner.com initiated a plan to re-activate the Bruckner Society. Filings with the State of Iowa and the Internal Revenue Service allowed the Society to be reactivated while maintaining its non-profit status. Thanks must be given to Charles Eble's friend, David Hempel, then owner of Eble Music without whose help none of this could have been possible. David showed patience, enthusiasm and concern at a time when his own life was filled with serious distractions. He assumed the role of President and Treasurer of the Society from 2009 until 2011. He presently serves on the Board of Directors. Benjamin Korstvedt, Professor of Music at Clark University is the current President. John Berky is the Society's Executive Secretary.